CAREER in sports journalism was always in the pipeline for Milltown native Ciarán Murphy who is gearing up for a sixth series of the increasingly popular Second Captains Live show. Having enjoyed another successful summer season on Radio One and being the cornerstone of the Irish Times Podcast schedule, Ciarán and his colleagues Ken Early, Eoin McDermott, Simon Hick and Mark Horgan are riding the crest of Irish media success. The youngest of Tony and Frances’ four sons, Ciaran’s love of banter and sport intertwined with a strong journalistic influence in the form of his uncle, former Sports Editor of the Tuam Herald, Jim Carney, the seeds for his future career were sown at an early age. 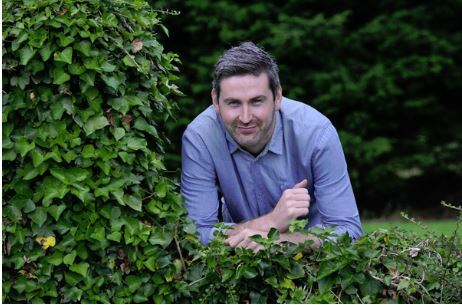 “My first football report appeared in The Tuam Herald when I was 13 and I remember being amazed that it had appeared in print exactly as I had written it,” said Ciarán, or Murph as he’s known on air. Following a degree in NUI Galway, Ciaran studied the master’s journalism programme in Dublin City university, which was to set him on the path to career success. “I met Mark when we were on the same course in DUC and we ended up getting work placements in Newstalk where Ken was already working. Eoin had been away traveling but came back about a year after we joined and then Simon came in on the work placement a year after,” said Ciarán. “We were on air from the very beginning and we were lucky that we got on so well which came across to the listeners. Within weeks they were back in broadcasting mode, serving up the first instalment of a podcast for the Irish Times that is now delivered four times a week, covering all aspects of sporting life. Five months into their new business venture they found themselves on the set of the pilot show for the Second Captains Live which is gearing up for a sixth season later this year. “I had never done any television up the that point but we all had a very clear vision of what we wanted for the show, and we got the right mix of guests, so it’s all going really well. The viewing figures are up in 150,000 and we’ve done 30 shows since we started so we are busy coming up with ideas on how to take the show forward. “We’ve had an exceptional summer of sport with the Euros and the Olympics, with hits on the podcast up on 1.2 million during the football, which is far higher than anything we achieved with Off the ball. For now, the five are busy putting the finishing touches to the second volume of the second Captains Sports Annual, which is to be published in the coming weeks. Ciaran and his other second captains will be hoping to surpass the first volume which was released last year. The team works out of offices on the corner of Baggot Street, where Ciaran’s film editor, his older brother John is also based. “I started out in radio and that remains a huge part of what I do but my main interest starting out was print journalism,” added Ciiaran. “I still get to do a bit with my GAA column for the Irish Times but the annual is another way of indulging that side of what I do, even though it’s a mish mash of everything from the silly to the serious interviews and a dedicated section to our fans around the world who sent in their #PBESOs – Pierce Brosnan’s Emigrant Shout Out pics. “I’ve been incredibly lucky to make a career out of my passion but I’ve had a lot of help and opportunities along the way. Mixing business and pleasure hasn’t hindered the successful development of the second Captains team who have defied the expert’s prediction that their deflection from Newstalk amounted to career suicide.